The spreading sheet of sea ice around Antarctica could be viewed as a napkin being draped over a monstrous water pistol. If, that is, the gelid napkin was a self-assembling machine that could reach beneath itself, aim the squirt gun at the planet’s shorelines, and squeeze the trigger. 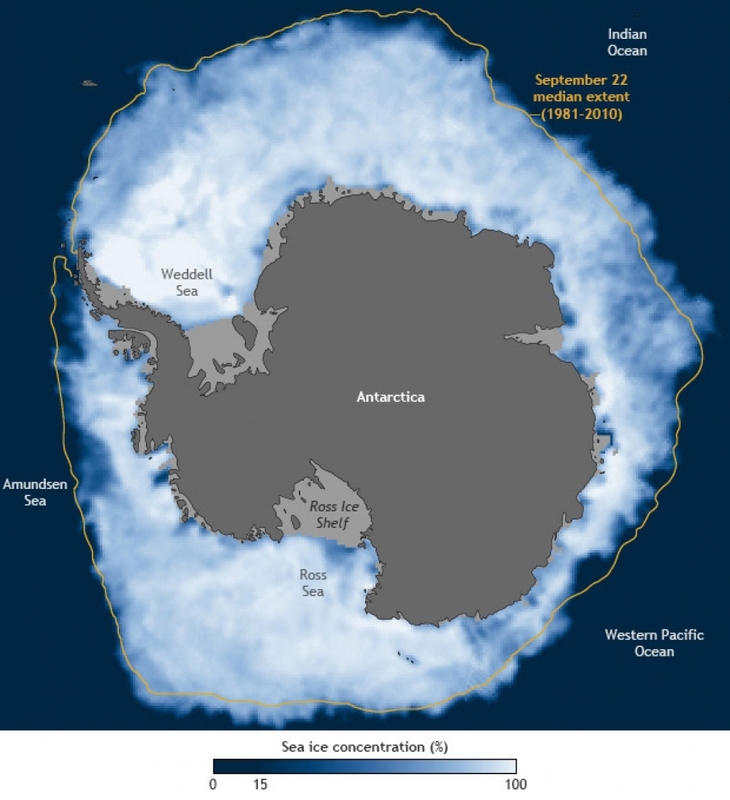 Research suggests that the expansion of Antarctic sea ice heralds ocean changes that will hasten ice sheet melting, by trapping heat beneath a layer of cold surface water, worsening flooding around the world. 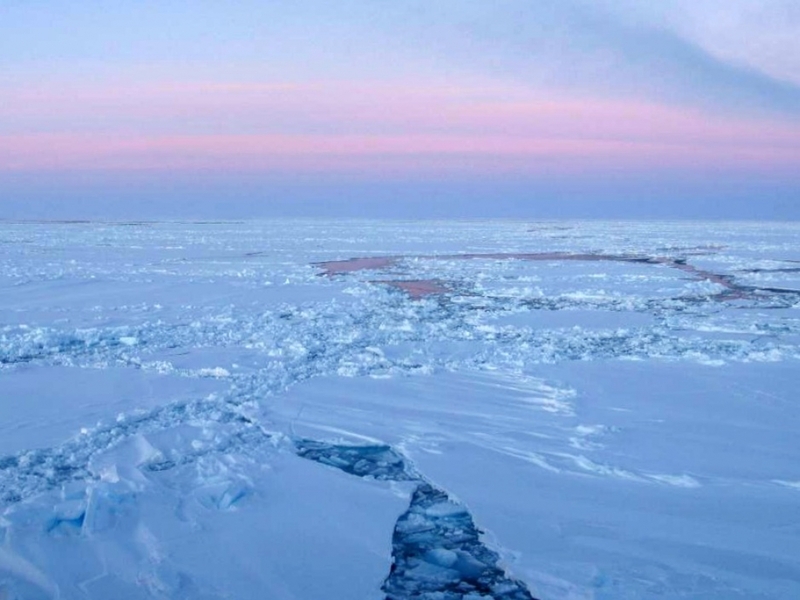 The stunning outward spread of ice floes atop the seas surrounding the South Pole has been caused by cold freshwater flowing out of melting Antarctic glaciers. (Shifting winds may also be playing a role in the breaking of previous Austral sea ice records.) That melting is forming layers of unusually cold and relatively salt-free surface waters in the region, the tops of which are being frosted with layers of blue-white ice. Those layers of cold water could recast the southern stretches of the influential Atlantic Meridional Overturning Circulation, which ferries water between tropical and polar regions, all the way from the Arctic to the Antarctic — with planet-churning consequences. Recent modeling indicates that these cold-water layers also formed as Antarctica melted during the prehistoric past, when they blocked warm water, which gets carried by deepwater currents to the Southern Ocean from the tropics, from surfacing. At the surface, that warm water normally sloughs its excess heat into the atmosphere, cools down, then flows back north — typically a standard feature of the Atlantic’s circulation system. 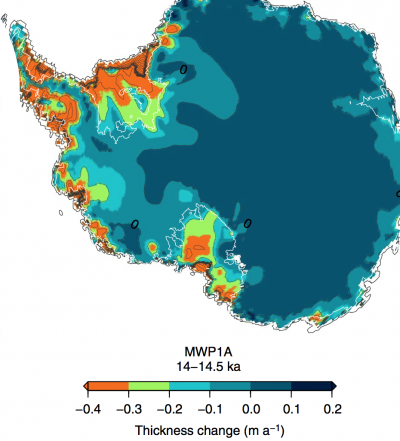 Without that Antarctic upwelling, the new study, which was published in Nature Communications, warns that the ice sheet is in danger of being melted from beneath at a hastening pace. Golledge collaborated with Australian scientists to produce model simulations of ocean circulations and changes in Antarctic ice levels during the past 25,000 years. During that time, Earth exited its last major ice age and great mountains of ice, particularly those in the Northern Hemisphere, turned to water, raising sea levels by hundreds of feet. Of special interest to Golledge was a planet-changing event of 14,000 to 15,000 years ago known as Meltwater Pulse 1A. That’s when oceans most rapidly invaded shorelines, with seas rising 50 feet in just a few centuries according to one recent estimate. September's record-breaking Antarctic sea ice extent. That extreme rate of sea level rise is unlikely to play out again in any kind of foreseeable future. Remaining ice sheets are fewer and smaller than they were back then. But there’s still enough water locked up in Antarctic ice to raise seas by about 200 more feet. For that reason, improving projections regarding the melting of the continent’s ice reserves, which are — by an ample margin — the largest on the planet, is a major priority for scientists and coastal planners. Golledge wanted to know how much of a role Antarctic melting played in Meltwater Pulse 1A, and during the similar but less significant Meltwater Pulse 1B — and why. He hypothesized that the entrapment of warm ocean water beneath a layer of cold surface water in the Southern Ocean played an important role. Solving the riddle of whether that was actually the case could help narrow projections of rising seas as greenhouse gases continue to trap heat on Earth. Some of the researchers’ computer simulations included modeling of the cap of cold meltwater in Antarctica; some of them excluded that cap. They found that the only way they could cause the Antarctic ice sheets to play a major role in the meltwater pulses in their simulations was by allowing that surface layer of cold freshwater to form. Antarctic melting during Meltwater Pulse 1A was accelerated by ocean circulation changes, modeling suggests. Worryingly, Golledge says the circulation changes associated with the meltwater pulses appear to be similar to the oceanic conditions that are starting to form today. The study, which was described by Scripps Institution of Oceanography professor Jeffrey Severinghaus as “an important contribution to science,” edges forward an important but difficult field of research. Antarctica’s future response to global warming remains one of the biggest and most consequential mysteries facing climate scientists.